You probably all know by now that Leader went all the way to Madrid to attend a soccer/football match between Real Madrid and FC Barcelona. 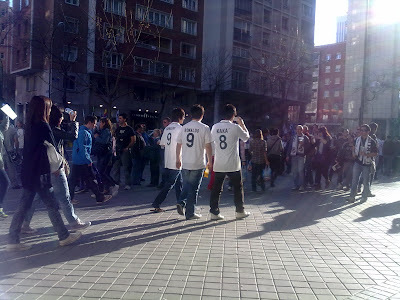 Here's a photo of him walking towards Stadio Bernabeu Madrid to watch the match. He's wearing a Ronaldo shirt! I'm not knowledgeable about soccer players, but is this the Ronaldo he's referring to? Keke. Correct me if I'm wrong. Leader really is a huge huge fan of soccer! Click on image to ENLARGE. 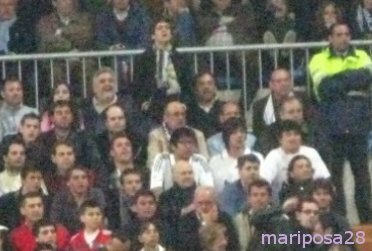 Also, thanks to mariposa, we have a picture of Hyun Joong watching the match. I'm impressed with how one could spot Hyun Joong amongst thousands of spectators during the match. Well, I guess our Leader really stands out, huh?